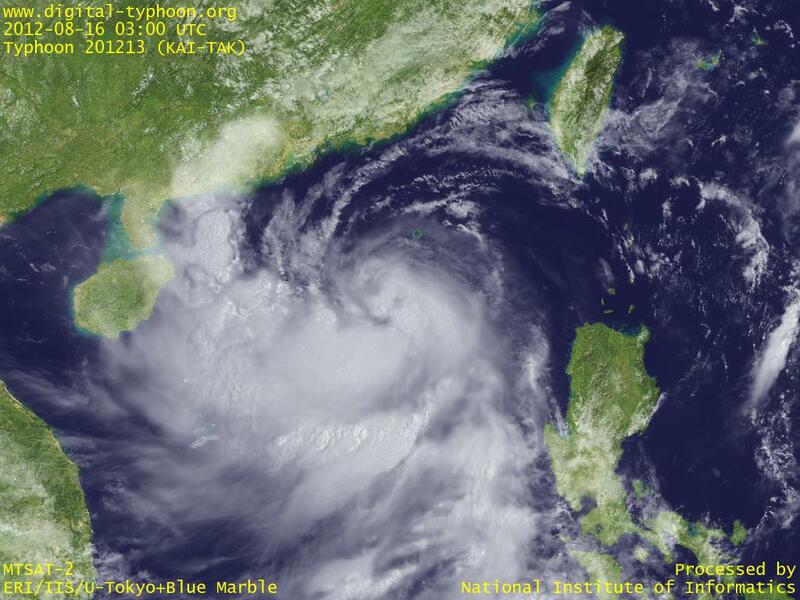 Typhoon KAI-TAK has passed Philippines to enter South China Sea, and is now slowly intensifying. It has thick clouds in front of the center, and these will soon cover the south of Guangdong Province and Hainan Islands of China. This typhoon was initially forecast to move to Taiwan, but its track has changed to more and more toward south, and now forecast to move to the north of Vietnam. Typhoon KAI-TAK made landfall at the north of Luzon Island. The center of this typhoon has been ambigous, and the accuracy of its location has been poor, but it is gradually becoming better organized. Because of the presence of clouds in the west and the south, heavy rains have been observed in north of Luzon Island, which caused two deaths already. This typhoon is foreecast to enter South China Sea, and will draw near to Guangdong Province around Hong Kong. Typhoon KAI-TAK is now active in east of Philippines. This typhoon is forecast to move northwest to the neighborhood of Taiwan.